Each year I start my garden with grand visions of endless bounty. Something happens around the first part of July though. I’ve gotten full of squash and cucumbers even had a few choice tomatoes; basically I get too full to keep up with the invading army of weeds and pests. The spring veggies are petering out as well as some of those early squash and cucumbers. 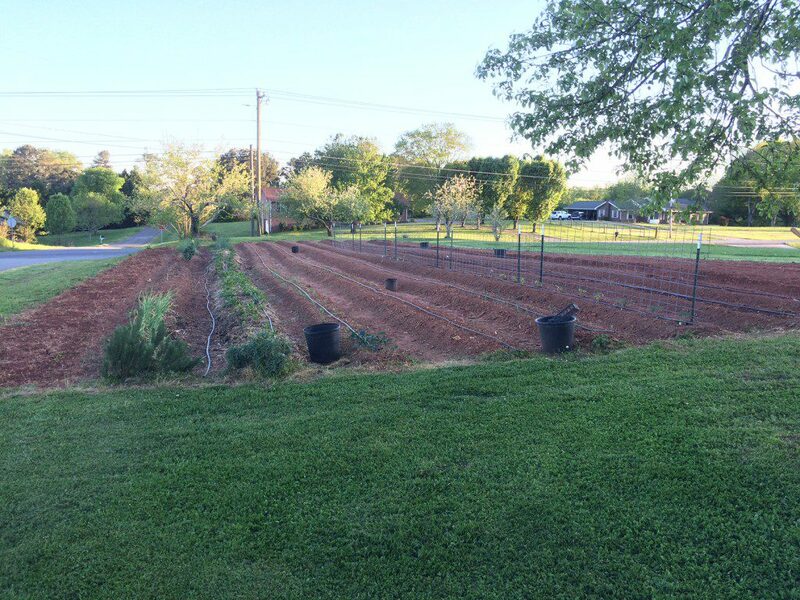 Then there is the stifling heat and humidity that makes going out in the garden almost impossible before 7 p.m.
Well this year I have a plan keep those garden beds from turning into pasture. No, it’s not mountains of mulch or more hours with the hoe and tiller. Enter Buckwheat (Fagopyrum esculentum), buckwheat is an unusually fast-growing plant grown for its grain like seeds in commercial agriculture. In the home garden it is one of the best summer cover/green manure crops available. The strip on the far left was outside of my garden prior to this year and was just grass, clover and weeds. It was tilled and seed was broadcast on April 17th, 2016. George Washington and Thomas Jefferson were some of the first American farmers to grow buckwheat as they recognized its benefit in a healthy crop rotation. Native to Russia the flexibility and adaptability led it to be grown on more than a million acres in the U.S. in the late 1800’s. The grain is ground into flour and used in a variety of foods from noodles in Japan to breakfast staples like cereal and pancakes in the U.S. I even had pillows made from buckwheat hulls when I lived in the tropical Pacific. The pillows are meant to be cooler on your head because of the increased space for air. I never got over the crinkling noise each time I would move however. Buckwheat is easy to grow by simply broadcasting seeds and lightly raking them in. A pound of seed is recommended per 500 square feet of garden space or 3 ounces per 100 square feet. You can’t really put too much seed down and since you will usually have to buy it in bulk from a local feed store; better to err on the side of too much. Buckwheat does not require highly fertile soils but will benefit from modest levels of nitrogen. Its many fine roots are well adapted at finding lower levels of Phosphorous and when crop residues are returned to the soil it becomes more available for other plants. Germination begins in about 3-4 days and within 10-14 days the ground should be fully covered with emerging leaves. This quick leaf cover will protect your soil from erosion, retain moisture and shade out those dastardly weed seeds. Now just sit back, drink some iced tea and wait for the best part which is the floral display that begins 3-4 weeks after planting. A large dense planting will literally stop traffic; my neighbors and passersby in my neighborhood have told me they always slow down to admire the five by hundred foot strip that I have along the road. The flowers of buckwheat attract all kinds of beneficial insects like pollinators, wasps, and ladybugs. 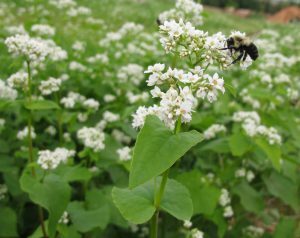 The prolific flowers on buckwheat are a good nectar source for honeybees and other pollinators. The resulting honey is dark colored and distinctly different in taste from clover or wildflower honey. The timing of flowering is also very beneficial to bees because the mid-summer is usually when there is less native forage available for bees. Just remember that those prolific flowers that the bees are pollinating each turn into a seed if allowed to develop and dry on the plant. So if you do not want buckwheat carrying over into your next planting it is best to cut the plants or till them under 2-3 weeks after flowering. Some growers will cut it and leave the plant residue on the surface as mulch providing a pre-mulched area for new transplants. Same view on May 18th, 2016. Note the road on the left side of photo where neighbors slow down to take in the view. Posted in Bees, Beneficial Insects, entomology, Home Gardening, Organic Gardening, Vegetables. 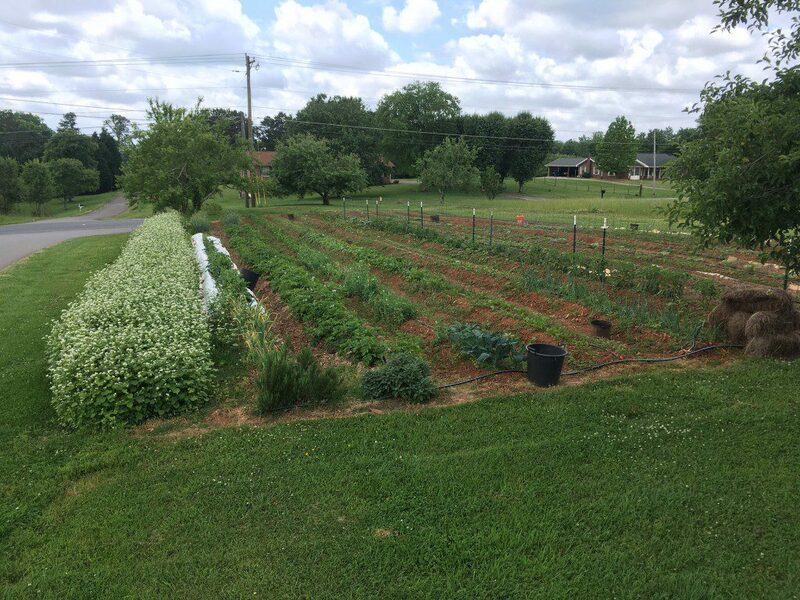 This entry was tagged bee forage, buckwheat, cover crops, organic gardening, organic weed control, vegetable gardening. Bookmark the permalink.